Rowan hadn't seen Lillian in over a year-not since she broke his heart and killed his father in one fell swoop-so why would she pick today to just show up outside his favorite coffee shop, dressed in outlandish clothes and pretending she doesn't recognize him. Is she turning to Tristan now in some pathetic effort to drive them apart? Why insist her name is Lily? And where is her Willstone? Her wild claims of being from a parallel world are just crazy and pathetic...right? 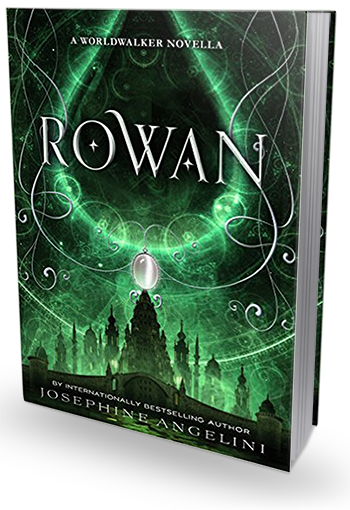 Get a glimpse of Rowan's side of the story in this thrilling e-short edition to The Worldwalker Trilogy by internationally bestselling author Josephine Angelini. As usual, I dream about people dying. But this time, they aren't getting pulled apart by Woven. This time people are killing each other, and I'm at the center of it. I'm just standing there while a sea of savagery heaves around me. I have no weapon, and no witch inside me. I'm defenseless. That's not what terrifies me though. What pulls me up from sleep is knowing I started it. I stand there, listening to her smothered cries, wishing I could make them stop. I'm too scared to think it, but three words fly recklessly through my head anyway.
. . . A second change. This is short. Like short, short. So this is going to be a super short review. Rowan starts just before Lily shows up in Salem and ends just after he accepts that Lily is not Lillian and she goes to sleep in the tent while still at camp. What I liked about Rowan is that we got a bit more back story into his past and his relationship with Lillian. We also see a bit more of the relationship dynamic between Rowan, Tristan, and Caleb as well. If you're a fan of Josephine's Woldwalker Trilogy and need something to tide you over before Firewalk comes out (five days!) and love extras download a copy of Rowan and spend a few minutes inside his glorious head. Side note: I will admit that I am disappointed in how short Rowan is. I initially thought it would be more like a novella, but it's more like a chapter or two. I did enjoy it however, even if it was for a brief time, and it's well written. And in the effort of full disclosure, I am equally disappointed that the preview at the end of the book is for Trial by Fire (chances are if you bought Rowan, you already read Trial by Fire). So while I'm disappointed about the length / format / production, at the end of the day (and in some of those final steps and decisions) I know authors only have so much say so I am not going to fault Josephine or her story for these issues.